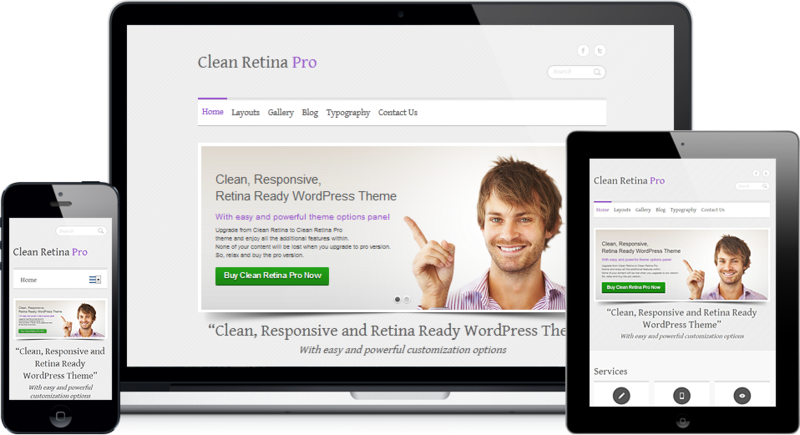 Clean Retina Pro is a Premium version of popular theme Clean Retina. It is a Simple, Clean and Responsive Retina Ready WordPress Theme which adapts automatically to your tablets and mobile devices. It includes all options of Clean Retina Free theme and many more additional powerful options. Some of the additional highlighted options, image slider, font-family, font-color and font-size options, color skins, additional custom widgets, 8 page templates, 30+ social profile links, footer editor, advanced corporate template with testimonials options, background options (patterns and colors). Also, supports some of the popular plugins like Breadcrumb NavXT, WP-PageNavi, WP Retina 2x and Contact Form 7. It is translation ready. Have a look on some of the unique features that makes our themes stand out from the crowd. Now you can enjoy razor sharp text, vibrant colors and crisp images on your retina display devices like new MacBook Pro, iPhone (4/4S/5), new iPad. Change your website layout, look with built in theme option without editing the code like logo option, favicon, social links, custom css, custom webclip icon and more. Make your own child theme without editing the parent theme code and without any fear of loosing your changes on update. Action hooks everywhere on theme. Homepage Featured slider to highlight your important post/page along with post/page title and post/page excerpt. Just add the post/page IDs that you want to show in slider. You can choose from five different layouts and 5 Page Templates namely Blog Full Content, Blog Image Large, Blog Image Medium and Contact page template. Revolution Slider Plugin is compatible to this theme as you can see in our demo. Purchase it from codecanyon.net and create an amazing responsive slides with awesome effects. Choose from a narrow or a wide layout from in design settings of theme option panel. Plus you have the option to change the background, header, content and footer color. Includes powerful color pickers to change color throughout the entire theme. Plus you have the power to change from 4 pre-defined color skins with one click! We have a incredible support team. You can read our detailed theme instructions and use our support forum. You can mail us and we will quickly answer your questions. This theme supports custom post type for gallery support. Create categories to show the multiple gallery. Also contains 2/3/4 gallery templates. This theme support bbPress. bbPress is forum software with a twist from the creators of WordPress. Easily setup discussion forums inside your WordPress.org powered site. Theme is Responsive. Optimized to adapt any screen size. Automatically fits your tablet and mobile devices. Also adapts portrait and landscape view. Our themes are packed with bunch of following standard features. Here comes the Pro version of our popular free theme Clean Retina with many amazing features as per our user’s suggestions and request. Have a look, what’s new on Clean Retina Pro.